"New thinking about what we're eating"
Fresh is a film on crime, directed by Boaz Yakin and produced by Lawrence Bender (who also makes a cameo appearance in the film) in 1994. It's a coming of age story, chalk full of emotional twists and turns. It follows the life of a grade school boy who gets involved with the wrong crowd and ends up losing more than just his innocence to the streets. At first debut release, the movie Fresh went unnoticed and overlooked by the general populace, although it did win a critical acclaim. The film itself takes place during a drug epidemic in New York City's projects. It's been said by critics to be a raw and engaging film which breaches interest on real topics of concern for the youth of America. Fresh is the nickname of a boy whose real name is Michael. He's a 12-year old kid who was convinced into becoming a runner for gangster types; most notably a man named Esteban (Giancarlo Esposito). Working as an errand boy for the gangsters of the neighborhood, Fresh begins to realize over time that he no longer wishes for such a life. The only thing that has allowed for Fresh to survive as long as he had was his strategic use of intelligence and application of words and action. At one time comforted by his position in the world, Fresh knows that he must use his intelligence to find a way to escape his town. When one day Fresh witnesses the assassination of a classmate, it becomes clear to him that if he's found as being a witness to the crime, his life would also be at stake. This is when he devises his own plan of survival to trick the killers and escape, with his life intact. 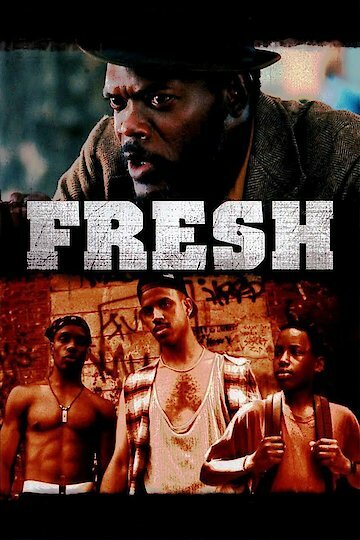 The boy Fresh is inspired by his chess games with his alcoholic, master chess player father (Samuel L. Jackson). He begins to devise a plan to get him and his addicted sister (N'Bushe Wright) released from their hopeless and depressing lives in the projects. Fresh is currently available to watch and stream, download, buy on demand at Netflix, Amazon, Vudu, Google Play, iTunes, YouTube VOD online.